TOP-NOTCH SERVICE IS OUR THING. 603 Estate Sales provides in-house, on-site Professional Estate Sales and appraisals to the state of New Hampshire. As our spectacular reputation continues to spread, our service area has grown over the years to an aprox. 75 Mile Radius of our central office here in Hillsborough New Hampshire (03244) to also include parts of Maine, Vermont and Mass. Sit back and relax knowing we do it all! We manage everything from start to finish. Our firm will organize, research, analyze, price, merchandise, advertise and hold the most professional quality sale for an optimal and profitable shopping experience. What kind of things do we sell? You will be amazed at what people will buy. From everyday household items to valuable Antiques, Tools, Collectibles, Art, Furnishings, Quality Household Goods, Firearms, Jewelry, Farming Equipment, Boats and Vehicles to name a few. We have buyers for every price point, we routinely sell single items for tens of thousands of dollars. Our team sets up your home to be as much like a store as possible to encourage easy buying, a high sell through rate and to maximize proceeds. We are the solution to sell everything quickly with the most profit possible. 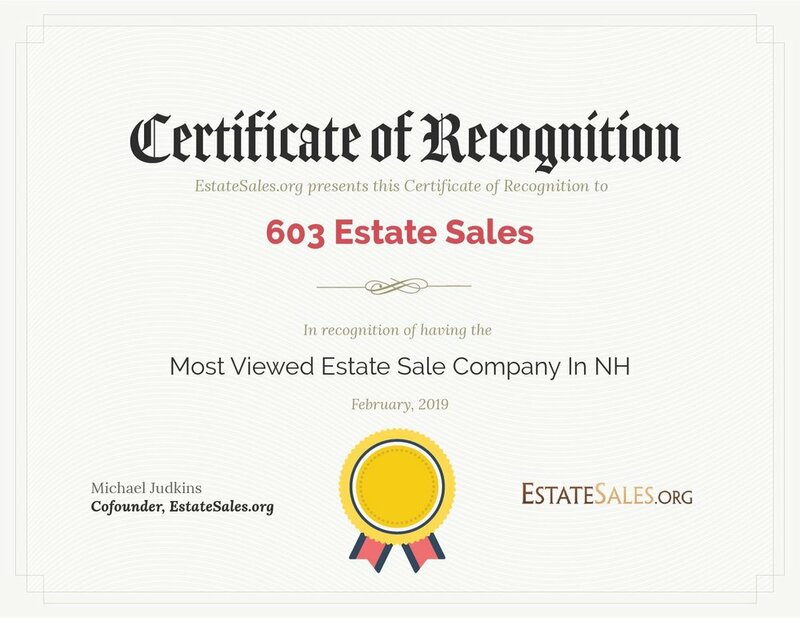 2016 & 2017 publicly voted and awarded the prestigious "Excellence in Estate Liquidation Award" as the #1 Estate Liquidator in all of New Hampshire. We are very well known in New Hampshire for exceeding expectations when it comes to both revenue generated and for a very high turn out of shoppers for each one of our sales. Our following of dedicated shoppers is second to none, having one of the largest followings of shoppers in the country! Our customer service is where we shine. All this is dedicated to our client by a full-time staff, who each has years of real world experience in estate-tag sales, each possess their own set of specialized knowledge so the client is assured of not only receiving top dollar, but also the most professional and reliable experience possible. When you hire 603 Estate Sales, you're hiring the best in the industry. We are a family owned and operated business, so be rest assured that our hearts are immersed in this business and because of that, we are dedicated to remain the #1 Estate Sale & Personal Property Liquidation company in New Hampshire. The success of our business is directly derived from the success of your sale.